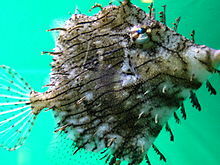 Tasselled Filefish, also known as the Prickly leather-jacket or Tasselled Leather-jacket, is a demersal Marine fish belonging to the family Monacanthidae. They primarily eat algae and small invertebrates. They are known for eating bristle worms. Reef Compatible: No - best kept in a peaceful fish-only aquarium. This filefish is related to triggerfish, but much more peaceful. It has a great personality and is a great eater. 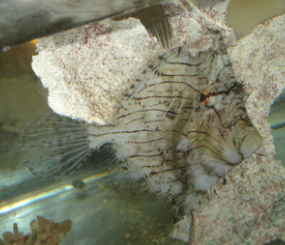 The Tasselled filefish should be effective at controlling bristle worms in your tank (it eats them).